Sarah Moses '16 and Harlow Figa '16, with this year's seminar's curator David Pendleton in the center. Snuggling up in a comfy seat in a movie theater, munching on some snacks, and waiting curiously for the plot to unfold—that sounds like a good way to spend some of the hottest days of the year. But for Sarah Moses and Harlow Figa (both Class of ‘16), their recent time at the movies was much more immersive than that. 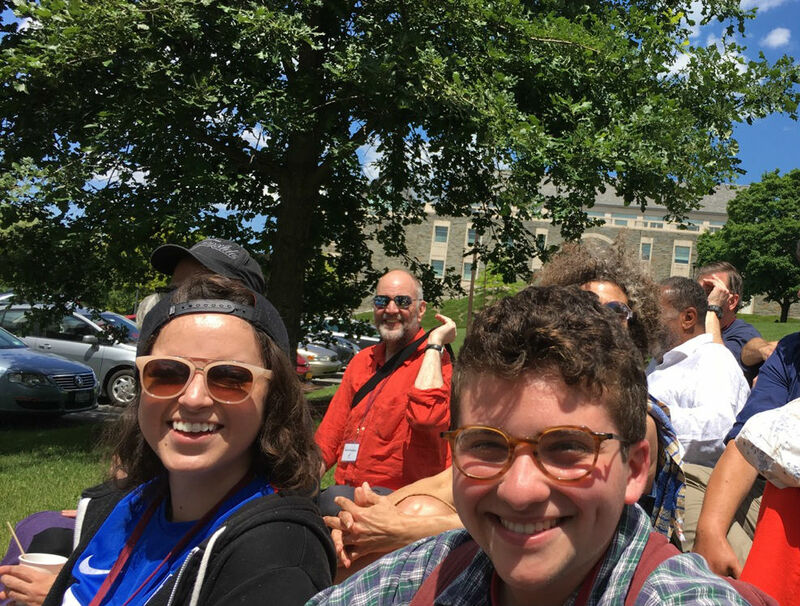 Thanks to funding from the John B. Hurford ‘60 Center for the Arts and Humanities (HCAH), the two recent graduates received a once-in-a-lifetime opportunity to visit this year’s Robert Flaherty Film Seminar, an intensive, weeklong celebration of documentary films replete with a communal living experience, at Colgate University this past June. They were accompanied by HCAH Visual Media Scholars and Visiting Professors of Independent College Programs Vicky Funari and John Muse. Moses, who majored in film and media studies at Swarthmore College and spent a good part of her Haverford education taking documentary filmmaking courses with Funari, knew that the seminar would provide an excellent bridge between her Haverford education and her future career in documentary filmmaking. But she was also aware of how challenging this experience would be. “24/7 for a week, you are living, drinking, and breathing film,” says Moses, who was especially touched by the films of Joaquim Pinto and Naomi Kawase and the subsequent discussions about love in these works. This year’s seminar was curated by David Pendleton, the director of the Harvard Film Archives and this year’s Seminar programmer. However, in order not to allow prejudice color the participants’ experience of the films, no detailed scheduling was released prior to the projections. “The days were surprises as they came—while each day followed a similar schedule, we would not know what films were playing until the lights were lowered in the theater and the projector turned on,” says Figa, who majored in anthropology, with a minor in health studies. Having just finished a visual media anthropology thesis and started collaborating on a documentary, Figa was particularly excited for the opportunity to attend the seminar. “Attending the renowned Flaherty with a peer and two influential professors, supported by the Hurford Center—sign me up,” Figa says. Both Moses and Figa took away many powerful experiences and connections they made with the seminar’s participants, including the filmmakers themselves who joined them for meals and activities. The inclusive atmosphere of the seminar, comprised of people across many different professions, ages, and backgrounds, also gave them the confidence to share and discuss their own work. The two fellows will bring some of the films from the Seminar to Haverford this fall as part of an event they will curate in collaboration with the Hurford Center.